"...Anytime one says 'puzzle' and 'brilliant deduction' in the same sentence, one can't help but think of the great fictional detective Sherlock Holmes and his trusty sidekick, Dr. Watson. And indeed, Holmes -- and the real-life physician that inspired him, Dr. Joseph Bell -- were very much inspirations for 'House.'" ...Shore also hopes to draw more parallels to Holmes by drawing House's best, and likely only, friend, oncologist Dr. Wilson (Robert Sean Leonard), into the Watson role. "We're looking for Wilson to step up in that regard, as House's everyman, leaning over his shoulder and going, 'How'd you do that?' And more important, 'Why'd you do that?'...." Can deduce a great deal from just looking at a person. Can deduce and diagnose a great deal just from looking at a person. His name sounds like "Homes" His name is another word for "Home"
Sherlock Holmes fought deadly criminals Fights deadly germs, diseases and other medical problems. Used cocaine to escape boredom Uses Vicodin for pain in his leg, and also for boredom and the pain of dealing with "stupid" people. Arrogant. Said humility would be a lie Greg House is extremely arrogant. Read the agony columns in the paper Watches soaps, plays video games, etc. Languid and lazy when not on a case. Lazy until he is forced to look into something that intrigues him. His closest friend had problems with a wound in his leg (although initially, the wound was in his shoulder) Has a medical problem in his leg. Music is very important to Holmes and he plays the violin. Music is very important to House and he plays the piano. Aloof, although less so with his only friend and roommate. Keeps everyone except Wilson at a distance. Sherlock Holmes lives at 221B Baker St. In #207 "Hunting" we discover House lives at 221B — we see the number as House and Wilson leave in the morning (but we don't know the street). See a screen caption of the address clearly visible behind Wilson as he leaves House's home. 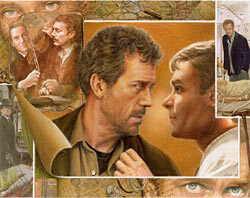 Hugh Laurie as Dr. Gregory House. 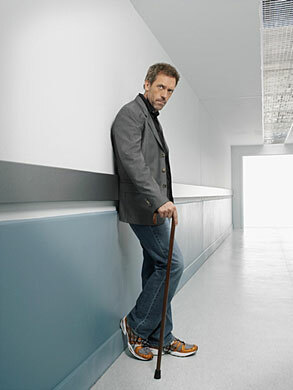 The third season of HOUSE premieres Tuesday, Sept. 5 (8:00-9:00 PM ET/PT) on FOX. "He is a little queer in his ideas — an enthusiast in some branches of science." "His studies are very desultory and eccentric, but he has amassed a lot of out-of-the-way knowledge." "He is not a man that is easy to draw out, though he can be communicative enough when the fancy seizes him." "Holmes is a little too scientific for my tastes — it approaches cold-bloodedness." "He appears to have a passion for definite and exact knowledge." "The reticence which he showed on all that concerned himself." "There was a world of sarcasm in his voice as he spoke." "I have a lot of special knowledge which I apply to the problem, and which facilitates matters wonderfully." "I am the most incurably lazy devil that ever stood in shoe leather — that is, when the fit is on me, for I can be spry enough at times." "Eliminate all other factors and the one which remains must be the truth." "Viewing the matter as an abstract problem, I had forgotten how personal and painful a thing it might be to you." "I could only say what was the balance of probability. I didn't at all expect to be so accurate." "Was there ever such a dreary, dismal, unprofitable world? ...What could be more hopelessly prosaic and material?" "...sat nursing my wounded leg....and though it did not prevent me from walking, it ached wearily at every change of the weather." "...I... limped impatiently about the room with considerable bitterness in my heart." "...three qualities necessary for the ideal detective.... the power of observation and that of deduction... [and] knowledge...."
"You have an extraordinary genius for minutiae."